This grand gent came into the shelter as a stray and is ready and willing to start the next adventure in his life! If you can’t adopt him that’s okay, if you don’t live by that’s okay you can still share. We can reach far and wide no matter where we actually live! Gracious as can be, Glen welcomes you into his domain with a soft meow while his long tail curls around your leg. He is very affectionate and loving. He would like to be king of the castle and isn’t keen on sharing. 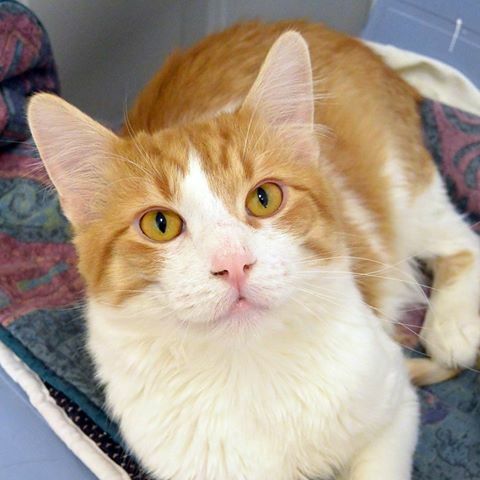 Does this regal young man sound like the Prince you have been waiting for? To adopt, please complete the adoption application found here. Glen is such a pretty kitty. I love his orange markings! Glen is just beautiful and cats are so wonderful! I can’t wait to get another one. What a cute cat! I hope he’s adopted very soon! What gorgeous eyes Glen has! Our two are adopted kitties. Hope he finds a forever home! My daughter just adopted a cat last weekend. Since we have always had cats since she was young, she is aware of the responsibilities involved. Such a beautiful cat, I hope he finds his Forever Home! My 2 sons rescue 2 cats each. They are the sweetest cats! Alex was in the shelter for 6 years and never got adopted. They came home with 2 cats because he felt sorry for Alex never being adopted. So proud of my sons. I do not have a cat just 2 dogs. We had a cat the came to the house to adopt us and lived to be 17 years old. Oh he is such a cutie, I recently adopted two older cats, I am so greatful that I did, they sure fill my life with so much love.. I do hope this cat finds a good home. I will share this post on facebook also ..
I’m not a cat person but Glen looks like a sweet kitty. I know a few people who would love him. Glen is so handsome. He looks a little like my cat!